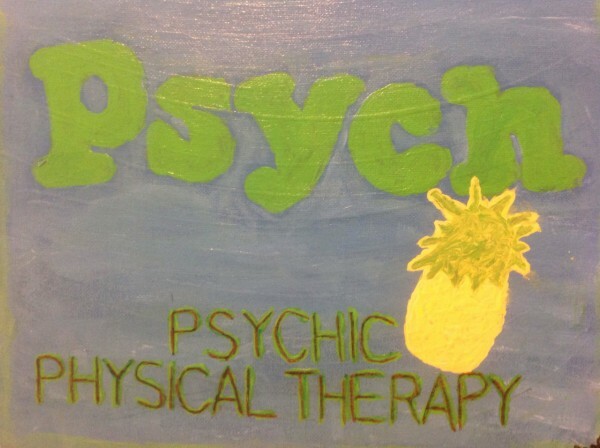 Fake Psychic, Real Physical Therapist. IDK why I am so lazy about posting my art, omg! But look, here is the piece I did for K for his 50th birthday earlier this year. 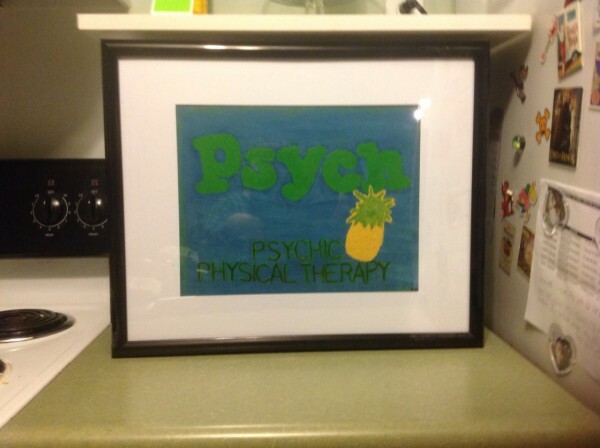 He is a huge fan of Psych - it's kind of freaking adorable - so I made him a little something to hang in his office. I tried to do the lettering by making stencils from the internet and spacing them out appropriately. I think the pineapple came out really well though. Like on accident, because the background was so bright that I couldn't get the pineapple coloring to cover it up and I had to like layer it, and not brush it on so much as just press it on, to get the pineapple to cover up the blue background. The effect ended with it looking like the surface of the pineapple and I really like it. Honestly, I wanted to do a picture of K’s face doing the psychic-mind finger thing that Shawn does, like a combo of K’s face and Shawn Spencer. But after an hour of drawing it, I got so frustrated. Sketching just is not my thing. So my sister was like, "Calm down, try something else, maybe do it in cartoon form." Well I am even worse at that, but I tried and when I showed it to her, she said, "Omg, he looks like Gollum." Which is, honestly, what I thought too. I stepped away from it for a bit, but I was so frustrated and growly and stuff about it and then my sister came up with this brilliant idea and at first I was like, "No way, I hate doing lettering," but I decided to try it out and hell yes, this was the way to go. 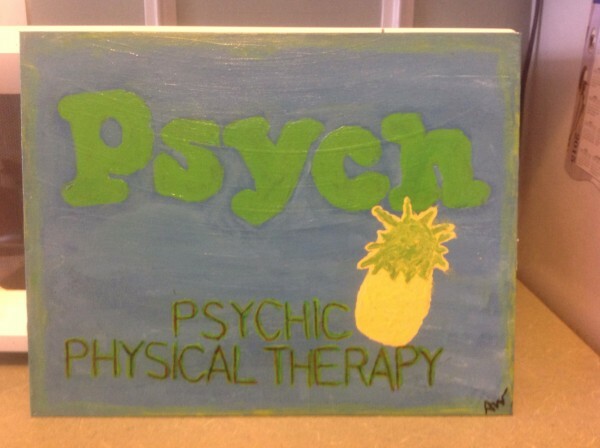 And yes, I wrote Fake Psychic, Real Physical Therapist on the back. When I gave it to him, his whole face lit up - it was so super cute. Then he had to hug me and when I told him it had been my sister's idea to go with the office sign, he was all, "Where did she go, I want to hug her too!" 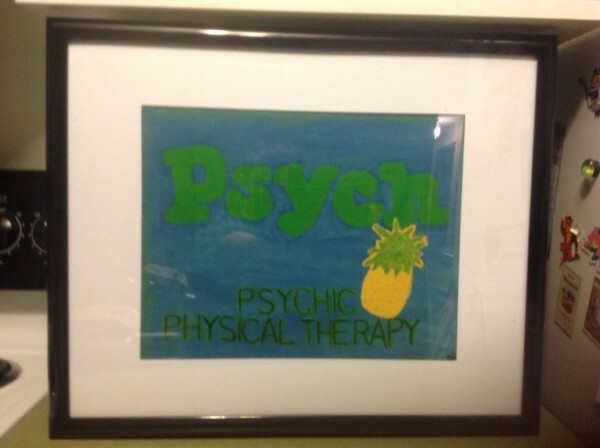 Anyways, this my Psych art I did for K’s 50th birthday! I'll try to put up some more soon, I swear! So glad I decided to check up on your LJ while I was over here, We talked about this sign and I'm so glad I got to see it, it's very cool, I can imagine he loved it a ton. Art is a great gift. Thank you! I put it up on Tumblr too, I am surprised you didn't see it there. It came out so much better than I thought it would and looking back on it, I think this was a way better idea than the sketch of him. Like this he can hang in his office and it works as an office sign and everything. These photos show pretty well how bright the coloring is too, which is something I really liked about it. I get frustrated when working on art but I try to stick with it cuz I know I'll like the end product. Maybe I saw it and forgot, I can be like that. But yeah it is awesome, great present for K.